Instantly, we became tigers and others became lions, elephants or hippos. 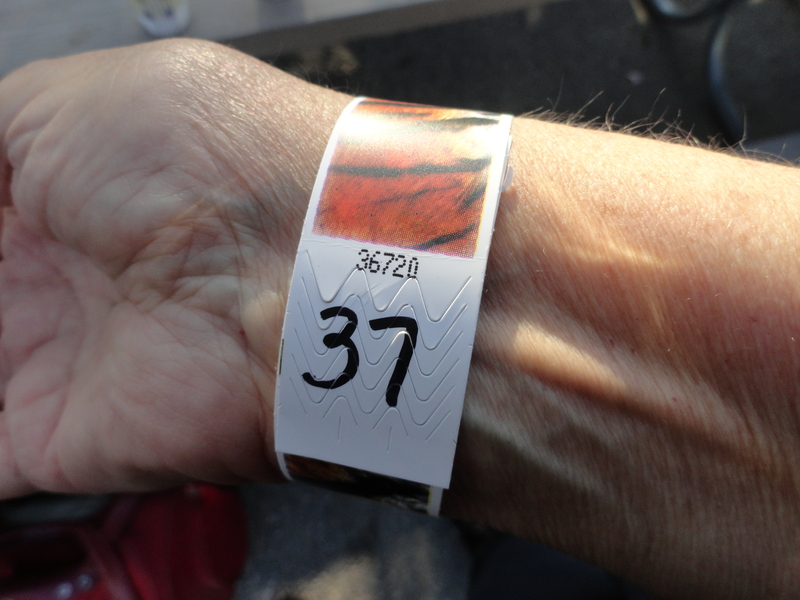 And, in case we forgot, a simulated tiger skin wristband imprinted with our tent number reminded us. Next came a t-shirt. 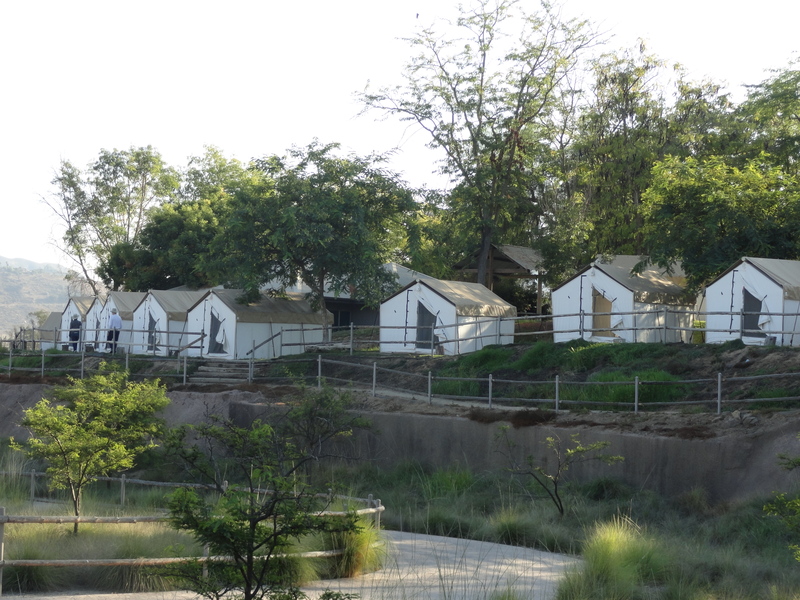 Then the tiger group was on its way to a roaring and snoring good time on a safari in the San Diego Zoo Safari Park. 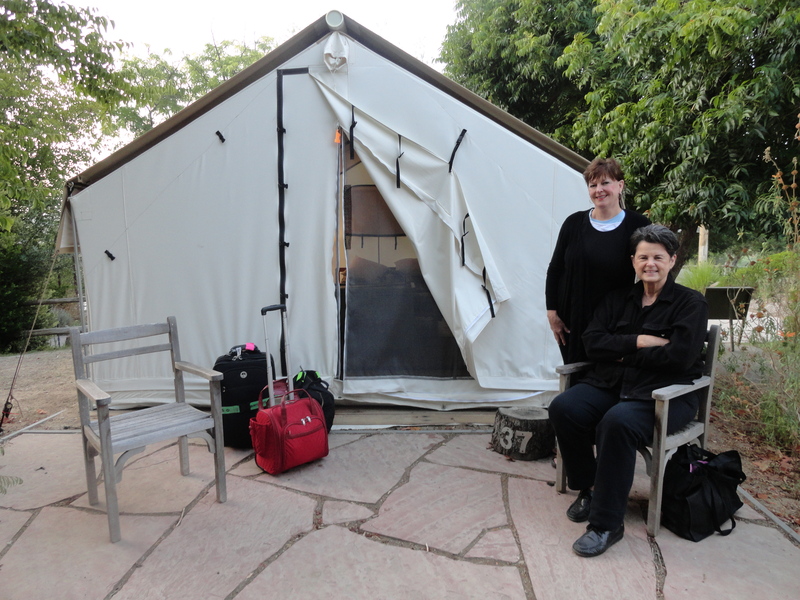 Hand luggage in tow, we began searching for our tent, one of 46 overlooking the African savannah where giraffe, Northern White Rhino, Cape buffalo, African crowned crane, grant gazelle, oryx, and giant egret roam daily in the Safari Park, 35 miles north of the Zoo. Finally, we found our tent #37 written on a tree stump stool. 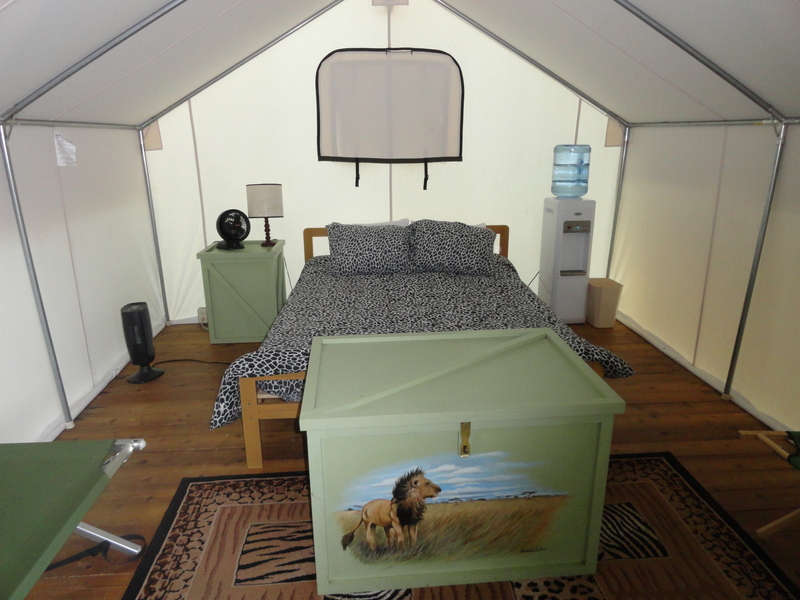 Unzipping the tent “door” revealed a normal hotel room encased in a heavy canvas tent. The electric lamps, fan, heater and hot and cold water all worked so we were in business next to the elephants.. The 17 elephants were putting on a welcome show for us: eating hay, pooping, swimming and submerging trunk and all under water, rocking and rolling and twisting to their silent music, and flipping over in their daily ritual. 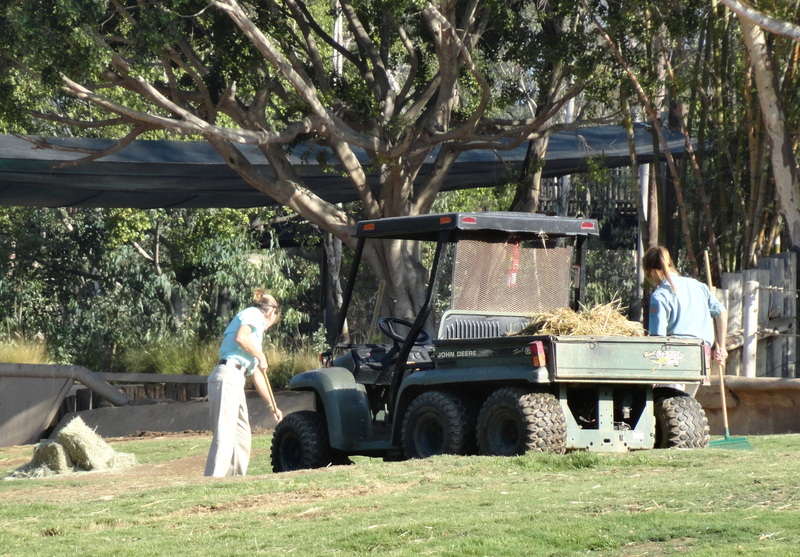 And they could do this because their exhibit compound had just been cleaned by 4 keepers who had hand raked and collected their poop from the previous day. Each day, 2,000 pounds of poop is gathered and placed in a Bobcat bulldozer and larger truck, then delivered to local farmers for fertilizer. Too soon, the tiger group had to leave the elephants and continue our orientation tour. This time our hunt was for the restrooms, as there were none in the tents. A block or so away we found our target, full-service restrooms including showers. The dinner bell was calling us so off we went for cocktails, then chicken, green salad, squash, and cake overlooking the Park’s African savannah. All 87 of us ate dinner on wooden picnic tables while watching the sun and animals end another day. On our safari, we were given a glimpse into “as the elephant world turns.” Drought-stricken Swaziland, Africa, allowed the San Diego Zoo to acquire 7 elephants, arriving via 747 aircraft. They were going about their daily lives, eating, pooping, sparring and resting with each other. Since males only associate with females for mating, one solitary bull elephant was by himself and was busy throwing dust all over his body to kill insects, to cleanse and to cool. 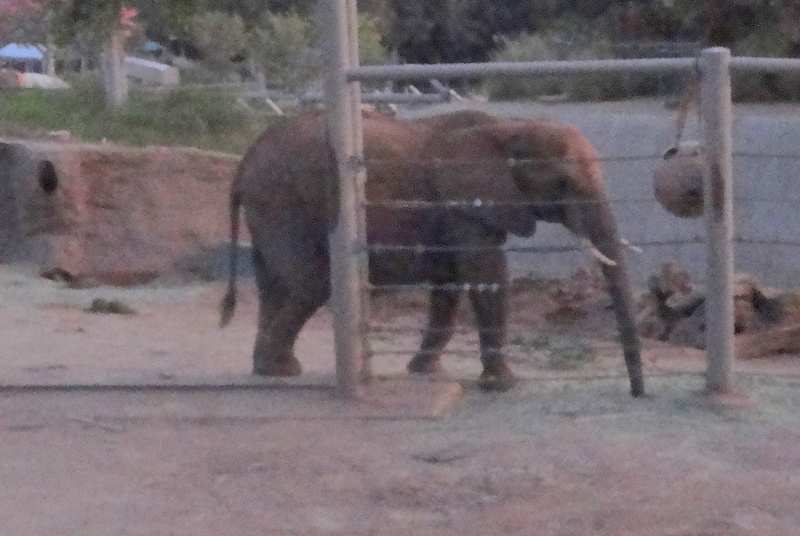 Meanwhile Umngani, a female elephant, was standing in the elephant yard nursery waiting her third calf’s birth. Her male and female offspring, Ingadze and Khosi, were visiting every day to see if they had a new playmate. 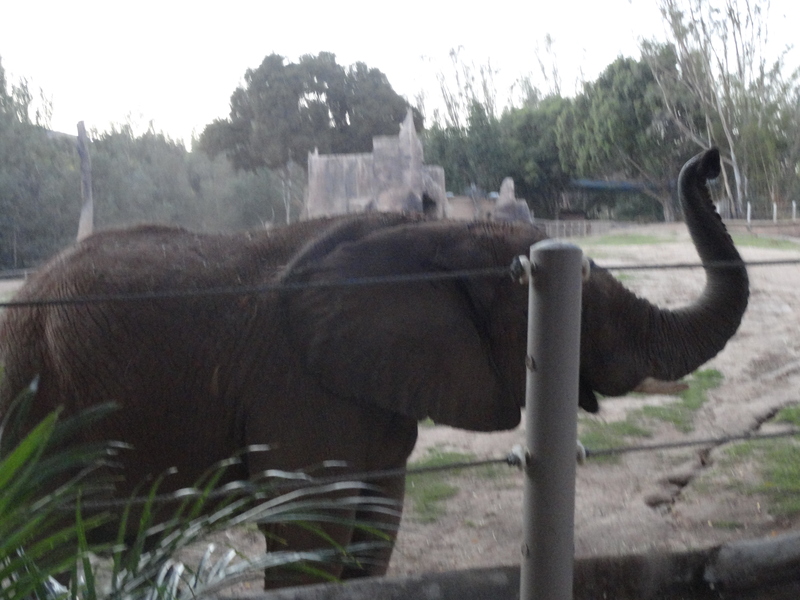 As we became more involved in the elephant world, we learned that male and female African elephants have tusks, but only the Asian males have them. So, when an Asian bull elephant first saw a female African elephant, he didn’t know she was female. He only knew females did not have tusks. After a few days, he figured it out and started showing her what a strong elephant he was by picking up a log and running with it and dropping it near her over and over. 1972, the solution was discovered when another female was added to their exhibit. Like elephants, a female Rhino only associates with a male when she is ready to mate. 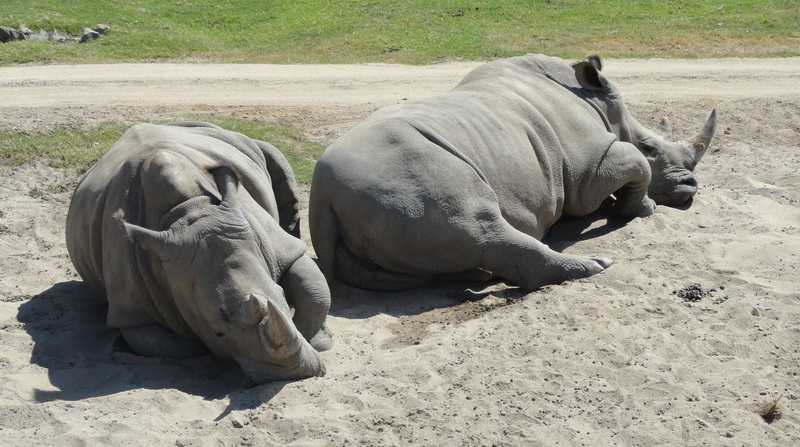 The rest of the time, female Rhinos prefer being with their female Rhino friends. 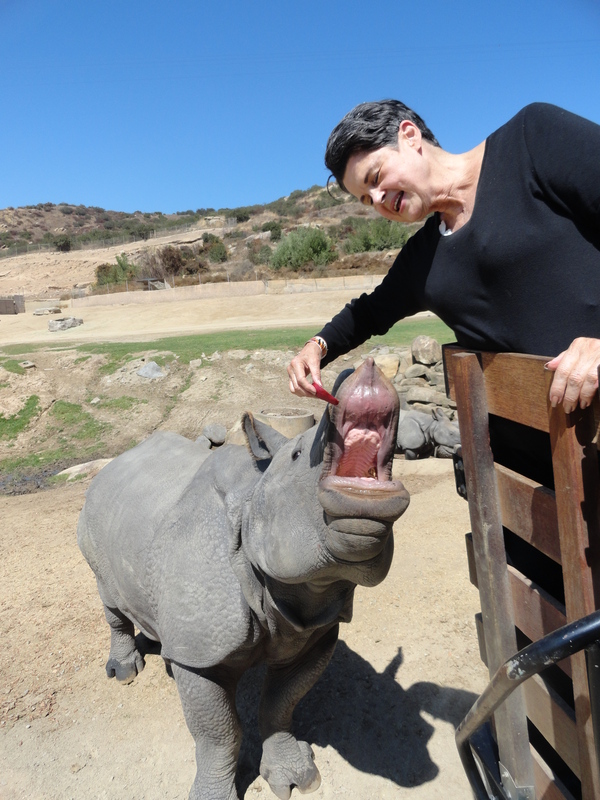 Now, there are many baby Rhinos. 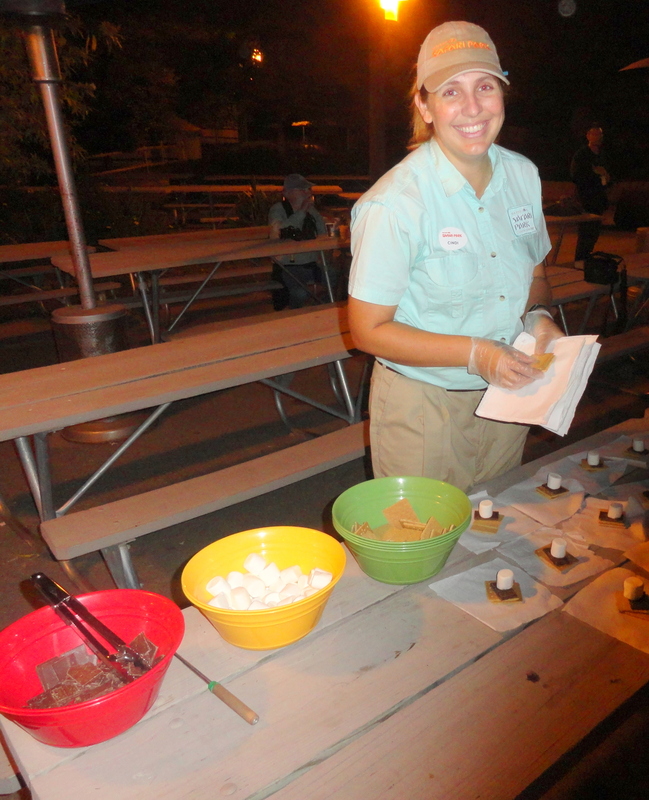 After a break for S’Mores and hot chocolate by the fire pit, we revisited the elephant world to find six elephants of all sizes and ages taking a late-evening bath. 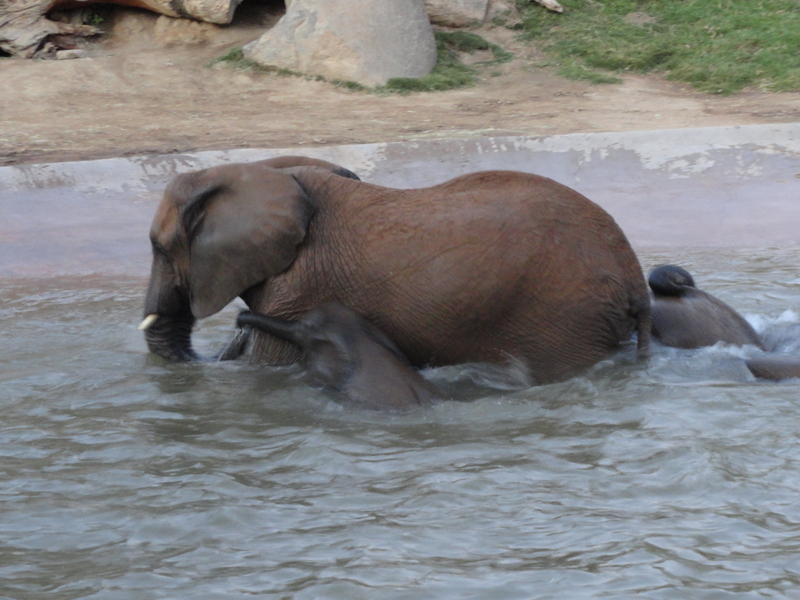 They totally submerged themselves in the water, rocked and rolled over with all four feet in the air, and did elephant acrobatics. What a soothing and calming experience this was to watch. After dark we entered the lion family world, invited there by the lion’s keeper into their kitchen and bedrooms. 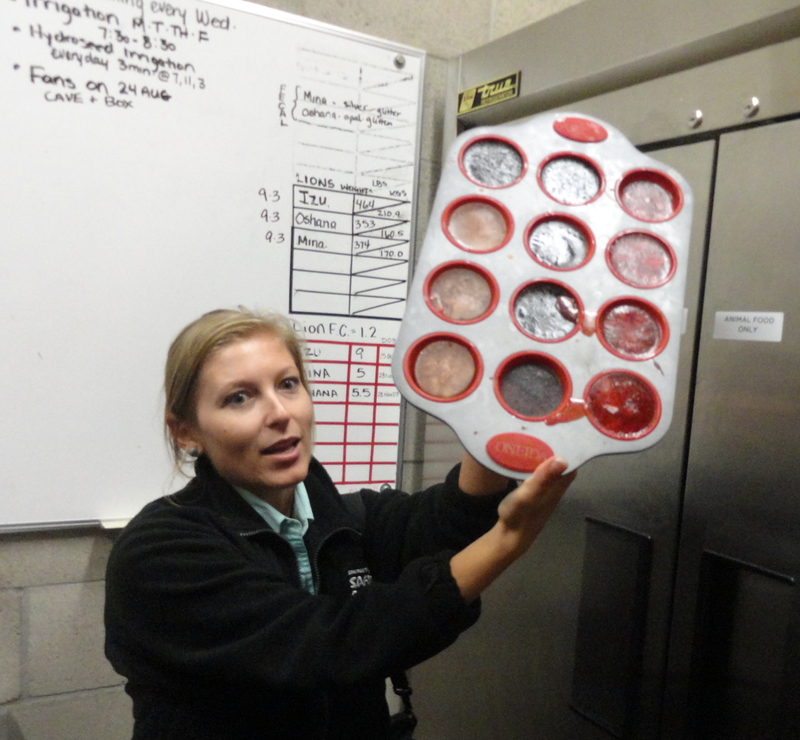 Their freezer was filled with large round stickless popsicles made from meat blood drippings. “The lions LOVE them, the keeper told us. 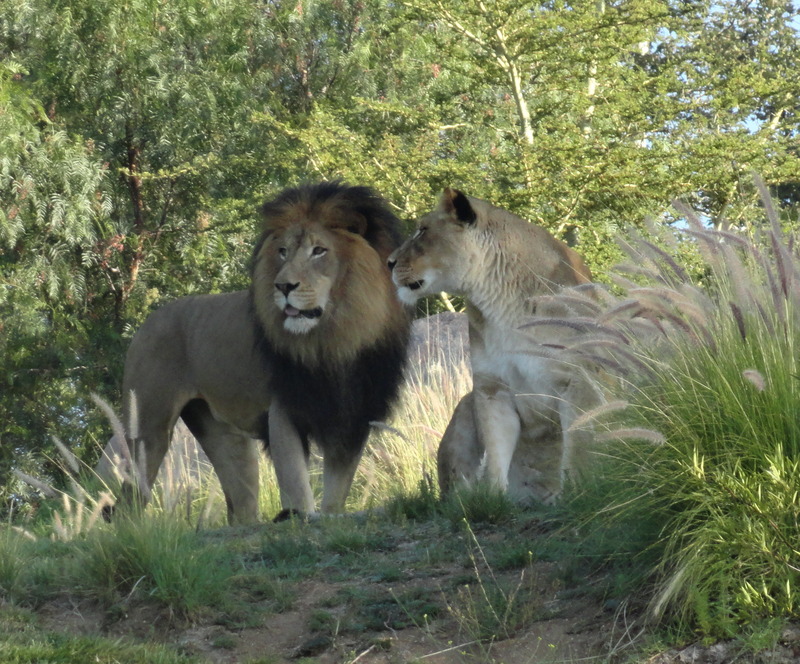 And every time she works with the male lion, Izu, she collects hair shed from his huge mane and keeps it in a plastic container for all to feel. It was downy soft. What an unexpected and rare glimpse into a world we would never have known. 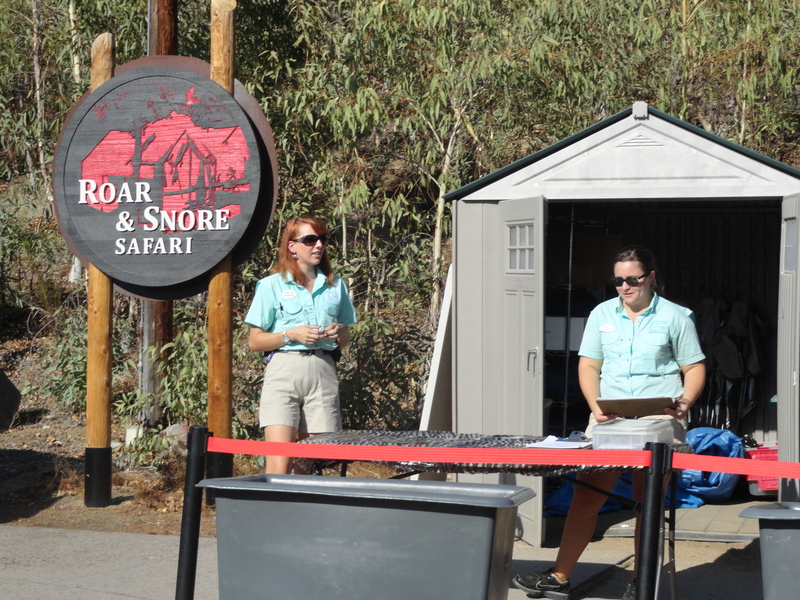 Finally, it was time to snore at this Roar and Snore safari adventure. We had no trouble meeting the 10:30 PM “lights out” curfew. Having been warned that elephants would trumpet and lions would roar during the night, we asked others if they heard the sounds. We didn’t know since we slept so soundly in our comfortable bed in the tent. So at breakfast, everyone we asked said “Yes” and we never heard one sound as we enjoyed snoring in our tent. 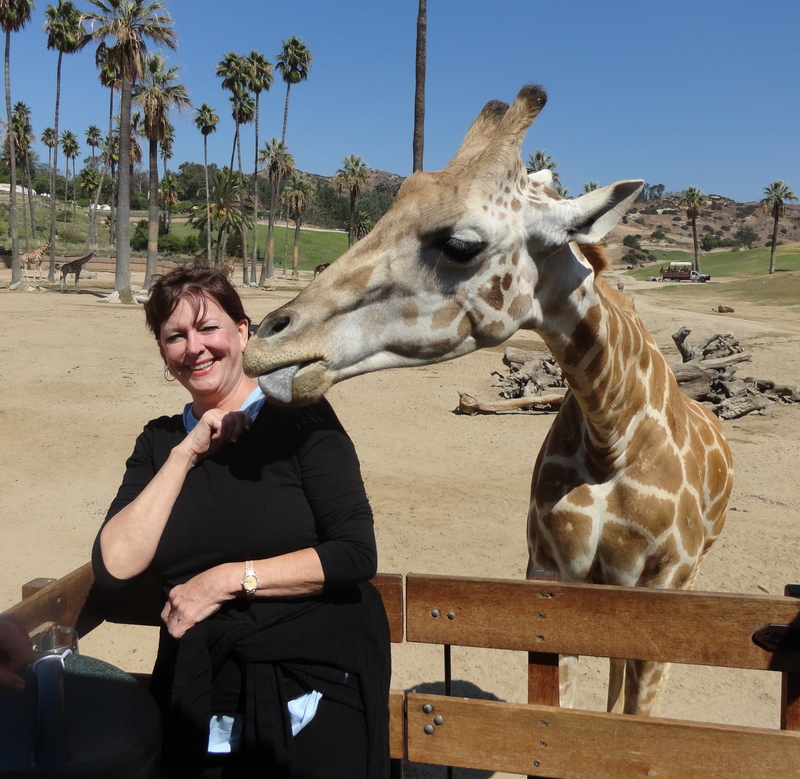 The grand finale was petting and feeding a rare Rothschild giraffe, Chomoa, and a rare Northern White Rhino, Bhopu. 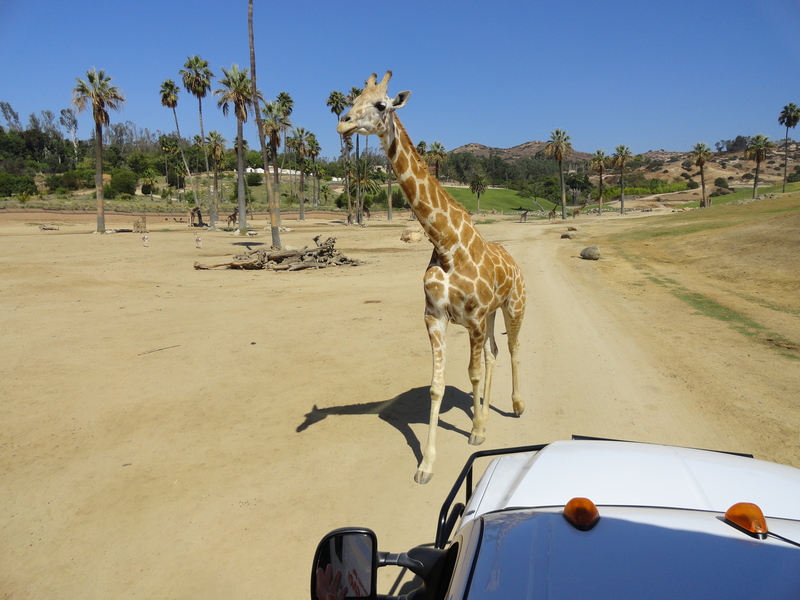 Caravan safaris are a regular event at the Park and these two animals know treats are available from the truck. So, each voluntarily nonchalantly sauntered straight to the truck to pose like a movie star with each person for photos in exchange for their favorite green leaf snack. Amazingly, each animal knew when all photos were taken so they just turned around and sauntered off just like they had come. The movie star Choma was finished with this truck and awaited the next safari to arrive. Then it was time to leave an awesome roaring and snoring fun safari adventure in the San Diego Zoo Safari Park and return to our normal everyday lives. But it sure was hard to leave those precious, priceless animals and their fun, unique personalities. I’m so glad you had a great time. I will keep following your travels.